If you've been doing your family history for a good few years, then why not show off your work in a bound book. 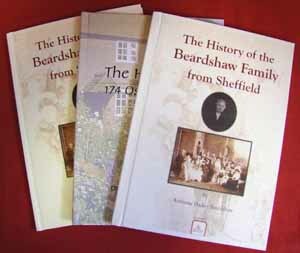 How many of your relatives have received a copy of the family history or even seen your work? Well now you have the opportunity to present your story in a professionally finished bound book that can't fail to capture the interest of any family member. Your family history book will be treasured not just for a few months or years, but for generations. Giving an unforgettable gift is just one of life's delights and then just imagine how many generations will appreciate your endeavours. My History have teamed up with a professional book printer so that you may have your family history printed and professionally bound with a personalised front cover displaying your family name and your own name as the author. There is no commitment to order more than one book and your data remains private. The book will have a hard cover and the pages will be printed on double sided paper. The number of pages in your book is up to you but we have a minimum charge for a book of 50 pages (25 sheets) or less. You only have to order one book. Choice of cover design (or design your own). Pages printed in full colour. Discounted prices for multiple copies. All you need to do is supply us with a file ready for printing, a few details and photographs (optional) for the front cover and we will do the rest. Please see our website for the file formats we accept. All your pages professionally printed in colour on double sided paper. These books are despatched direct from the printers and there is therefore an additional postage charge of £10 added to the cost of shipping.